After nearly half a century of paying very close attention to politics, Bob Dylan found politics paying very close attention to him (yet again) yesterday afternoon, when President Barack Obama awarded him and 12 others the Presidential Medal of Freedom. The medal is the highest honor an American civilian can receive. And the above photo of Obama gazing admiringly at Bobby Z in his shades at the White House is quite simply incredible. 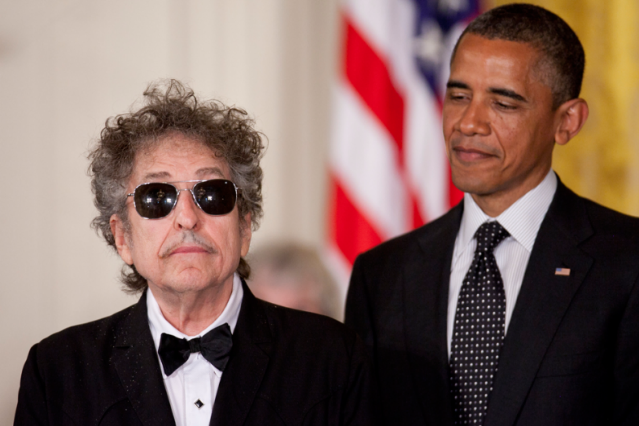 Joined by author Toni Morrison, astronaut John Glenn, and former Secretary of State Madeleine Albright, among others, Dylan was honored for his “considerable influence on the civil rights movement of the 1960s and… significant impact on American culture over the past five decades,” Obama said at the White House ceremony (via Rolling Stone). According to the U.S. government, “There is not a bigger giant in the history of American music.” The jury is still out on what Obama and Co. thought of these recent Dylan covers, however.